Above: a screenshot of the Toronto Earth Hour 2012 visualization. Earth Hour presents a particular photographic challenge: how do you show the before and after on a large scale? 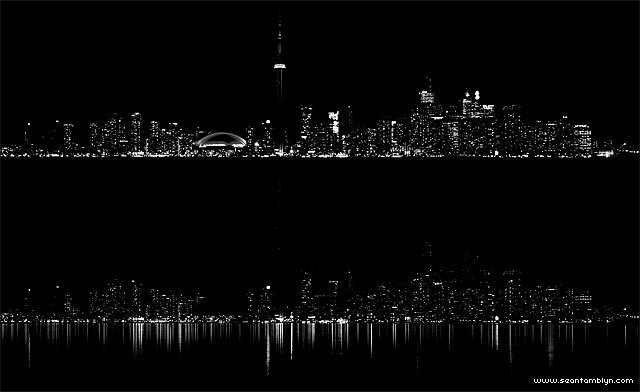 Most of the images of the Toronto skyline during Earth Hour suffer from the same problems. Either the images are shot on different days, with wildly varying ambient lighting (i.e. cloud cover), or they’re shot on the same day but are not truly reflective of what normally happens outside of Earth Hour — many lights remain unlit long after the Hour is over. Not to mention that the people who run the SkyDome/Roger’s Centre still seem to have trouble with their timers. C’mon guys, 8:30p isn’t that hard of a concept to grasp. Looking at the first three images of the Toronto Star’s Earth Hour 2012 gallery drives the point home: different lighting, slightly different angle of views, different timing. Toronto Earth Hour 2012: Before & After is the first attempt to allow a direct comparison between the Earth Hour skyline and the regular skyline. Using a preset camera, principal photography was captured at exactly the same time of day, in exactly the same place, using the same equipment. The only caveat was bad weather, the “before” images had to be taken two days earlier, but differences in sunset and moonrise times have a negligeable effect on bright city lights. Multiple imagery was captured before and during Earth Hour, both a full 4K timelapse sequence and 100-megapixel panoramic images captured at 15 minute intervals. The timelapse sequence was chosen for this visualization, the motion of planes and strobing navigation lights made for the most dynamic image. Presented here is a reduced 720p video, but the 1080p, 4K, and 100Mp panoramas show incredible details. Who left the lights on indeed. 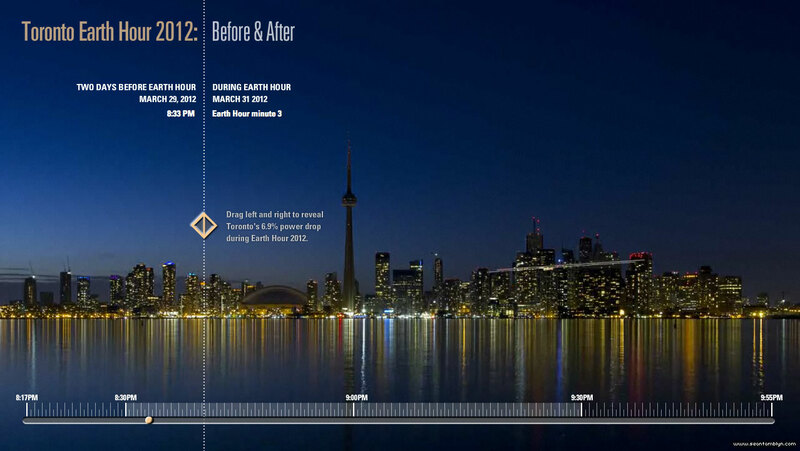 Above: a direct luminosity comparison of the Toronto skyline before and during Earth Hour 2012. The dome, tower, and corporate logos are all conspicuously absent in the bottom image. Careful processing of the imagery allowed the creation of a perfect overlay, removing all details but the lights of the city. Composited back onto the original photography, a seamless blend of the Toronto skyline both before and during Earth Hour allows the most detailed comparison yet. Click here to launch Toronto Earth Hour 2012: Before & After in a new window. This entry was posted on Tuesday, April 3rd, 2012 at 9:09 pm. It is filed under Visual Application Development and tagged with ActionScript 2.0, Adobe Flash CS4, Canon EF 17-40 f/4 L, Canon EOS 7D, Shoot RS-80N3. You can follow any responses to this entry through the RSS 2.0 feed.